Comedian Felipe Esparza, the winner of Season 7 of NBC’s Last Comic Standing, will be supplying gut-busting laughs at the Fox Theatre in Visalia on Friday, February 1. At one time, he was the mystery man in fellow comic Gabriel Iglesias’ early career set routines, only referred to by his first name, and it didn’t matter the situation in the story – good or bad – his catch phrase was “But it was funny, huh?” Well, he’s at the stage where he doesn’t have to ask anymore. With a string of television credits and specials under his belt, his career is rising, but it’s his origins that stand out the most that resonate in this country’s trying time. Being a part of a community filled with Hispanic comedy talent like Iglesias, George Lopez, Angelah Johnson, Willie Barcena, etc., he also isn’t a stranger to diversity and adversity, and those subjects he uses for his stage content. Growing up as an immigrant from Sinaloa, Mexico, he moved to Los Angeles and got caught up in the gang life and served a stint in rehab while being a teenage father. It was during his road to recovery that he got the epiphany to do stand-up comedy. Since then it’s been a sixteen-year odyssey to become a household name. His “immigrant-done-good” story may be contrasting to what people in the news may make you believe about immigrants, but Felipe doesn’t shy away from his background. With there being such a divide in this country, does he ever find himself feeling the need to cut back on his act to please these conservative-minded populations? “It doesn’t matter who the audience is. I’ve been to Connecticut, Detroit, Des Moines, I’m not a new comic, the audience knows what they’re getting so I don’t hold back,” says Felipe. It doesn’t seem there’s much to hold back his star from rising. He’s had recurring roles on “The Eric Andre Show,” NBC’s “Superstore”, TruTV’s “World’s Dumbest,” and “Russell Simmons Presents Stand-Up at the El Rey.” He’s got a Netflix special, “They’re Not Gonna Laugh at You” and another on HBO, “Translate This.” He’s making all the right moves to expand his comedy brand, and he’s using a resource that his predecessor comics didn’t have access to but it has become a go-to option. Speaking of podcasts, Felipe hosts a weekly podcast on the All Things Comedy Network called “What’s Up Fool?” and brings on a mix of guests ranging from actors to anybody he thinks has a story to tell. “For me and my audience, it’s a way for me to provide more content,” says Felipe. “Once the podcast is over they want another one right afterward. People love hearing stories and your struggles, with me I talk about anything.” It makes sense considering the fact you’re on a time schedule when doing a show, but on a podcast, there’s nothing but unlimited time to talk and share things that you wouldn’t be able to fit onstage. His brand of humor is not for the faint of heart. Known for his self-deprecating humor, he doesn’t pull back at making fun of himself ranging from his race, weight, looks. Even though we live in a very regulated, politically correct time with there being sentiments towards anti-bullying and shaming, but for him it’s all an act. “A lot of stuff I say I don’t mean, it’s a joke, I wrote it, and a lot of stuff I say is in character. The character I’m portraying is saying it, not me,” elaborates Felipe. If anything, he’s using his standup as a way to add light to the darkness that is shadowing the nation, and the best way to bridge the gap between the divide is laughter. “Comedy and music are ways to let other people know that you’re a person. 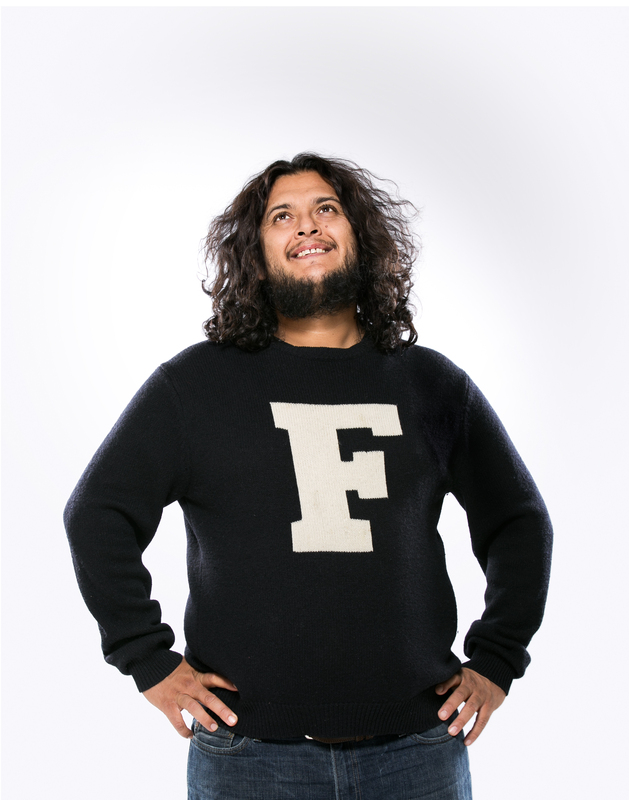 With my comedy, by the end of the show, it doesn’t matter who’s in the audience, they’re holding me like I’m their brother because my comedy is relatable, and I’m letting them know that we go through the same things,” expresses Felipe. I couldn’t keep it together hearing these bits, and no walls can contain this funnyman from entertaining the Visalia crowd once February rolls around.